While Dakota Style's packaging designs all vary wildly, most of the flavors have identifiable factors that potential customers will recognise. The small cartoon character and company brand at the top, the stripy bags, the 'Industrial Strength' company slogan at the bottom. Unfortunately that is all this bag has going for it. 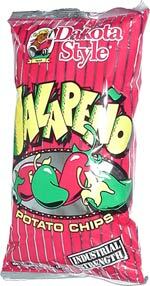 Jalapeno is a hot and spicy flavor, but they have turned into into a friendly cartoon. Some would suggest Jalapeno should be a challenge rather than a comedy offering. Dakota Style Chips look more like food than Potato Chips. Just the sort of thing you would thing was cooked fresh on the premises if they were served alongside a sandwich in a fancy restaurant. The hard, firm and crispy crunch was better than most we have reviewed. These Chips were hard and firm, with lots of bubbles on the surface, where they have been cooked deep in oil. Few of these bubbles were broken, as you often find with lighter crisper Chips. There was some seasoning, but mostly they were small and curly in nature and a dark orange color. The Nose Plunge test revealed a fairly heavy Jalapeno aroma. This made the taste test a little disappointing because while clearly tasting of Jalapeno, it was not nearly as hot and peppery as it could and probably should have been. There was little after-taste and while it was a pleasant taste, should a fiery pepper just be pleasant?